Another commonly used Mortgage Scam is the Double Owner Occupied Purchase. In this scam, a borrower buys two or more homes simultaneously, stating on the numerous applications that the home will be their primary residence. It is a crime to lie on a mortgage application. Borrower's engage in this activity to obtain better rates and terms on multiple transactions. This scheme is typically used to qualify for Non Owner, or investment purchases, as Non Owner transactions have stricter guidelines, typically require more money down and have higher interest rates than other transactions. Since the risk on a Non Owner property is higher than on an Owner Occupied residence, lenders pass the risk on to the borrowers in higher risk premiums, rates, and higher equity requirements. The other reason this is used is to qualify for loans that the borrower would otherwise not be able to. The advantage to this scheme is the fact that lenders on each transaction will not be aware of the future debt payments the borrower will incur with the new loans. In this way borrowers can skirt the issue of affordability standards and can show lower debt ratios than they will really have. I have heard of borrowers buying3 and 4 properties at once, in some cases 3 and 4 unit properties, all being represented as Owner Occupied residences. In the current climate this scheme is extremely difficult to pull off for several reasons. Credit searches and increasingly detailed, and multiple mortgage inquiries on a credit report represent a red flag to lenders. Additionally, loan servicing has increasingly become consolidated, where only a few companies service loans, so the likelihood the same servicer will have both loans on their books is extremely high. For example the loans may be funded through different banks, but within months may be sold to the same servicing company, in which case the scheme will be uncovered and the borrower will be in deep trouble. In my experience as a lender I have actually seen this happen. The servicer caught the issue within 30 days of close, and actually rejected both loans. The lenders then pursued the borrower with legal action and the borrower was forced to unwind the transaction at their own expense. This scam can be carried out in two ways. One route is through a single broker who places each loan at different lenders, thinking they are safe from discovery. The other manner it occurs is when a borrower uses multiple brokers, one for each transaction, to hide their intentions. I have seen it both ways. In either case the responsible parties are subject to prosecution and financial burden. The broker is actually putting their license on the line as well, as they can be disciplined and could lose their ability to continue doing business. A common Mortgage Scam utilized is called the "Straw Buyer". A "Straw buyer" means someone is used to obtain financing under the false claim to intend to live in the property they are purchasing. In most cases the fake buyer is given a lump sum to pretend to purchase the home in order for someone else to live in. In some cases the straw buyer is not even aware that their name is being used for the purchase of a home. The most common usage occurs when a borrower is unable to qualify for a loan on their own, so they instead find a friend, family member or acquaintance to qualify for them. In general the straw buyer will have stellar credit, an abundance of assets, and an income to substantiate the payment on said purchase. After the purchase transaction is completed the straw buyer's name may be removed from title, while someone Else's name is placed in county records as the owner. It is a crime to state on an application that you intend to live in a home when in fact you have no intention of doing so. The scheme works when the actual intended occupant makes the payment in a timely manner and satisfies the debt obligation. Many mortgages are assumable, and in the long run, the actual occupant may be able to take over the debt in their name. On the flip side, if the actual occupant defaults, the original purchaser, or straw buyer, is responsible for the debt and could face litigation for their part in the scheme. In a recent case involving a Newport Beach resident the offender plead guilty to mortgage fraud involving over $2.7 million in losses to lenders and HUD. The offender admitted to participating in multiple transactions between 1995 and 2001. The offender could face jail time if the court decides to put him behind bars. Fake Documentation is a gigantic problem in the industry. 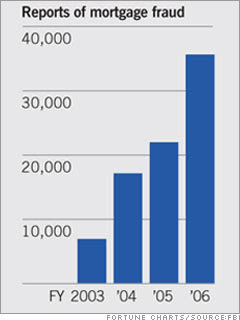 The Chart above represents the rise in reports of mortgage fraud to the FBI since 2003. False documentation is able to infiltrate every part of a mortgage application. Most people don't understand how a loan process works, but its actually pretty simple. On a basic level, the borrower submits an application to the lender, asking for an approval on a loan program. The application is received, reviewed, and either denied or approved. If the loan is approved the lender will require certain conditions to be met. Most of the conditions are simple documents that must be provided to the lender to prove the claims on the application, such as employment, assets, proof the property exists, and proof of the value of the property. Examples of these documents would be pay stubs, bank statements, property profiles, property appraisals, social security cards and photo IDs. Since lenders have increasingly moved to electronic transmissions, such as faxes and emails, most of this documentation is not in a paper format. Although this has increased the efficiency and speed of loan closings, it has also opened a window for fraudulent activity. Since many documents are accepted via fax, an unscrupulous person can, using document editing software as simple as Microsoft paint, alter documents in moments, and send them over as "Faxed Originals". Some attempts are extremely well done fakes, and others that look like a child was the culprit. Borrowers and loan officers will stop at nothing to close loans, whether it be changing or outright creating their own pay stubs, banks statements, rental verifications, credit reports, appraisals, photo IDs and social security cards. At times the borrowers and brokers are working together on the scam, and in other cases the broker or borrower is acting independently of one another. False employment on mortgage applications is rampant. Fake employment is being used on mortgage applications far more frequently than you would think is even possible. I have seen it over, and over, and over, and over again. 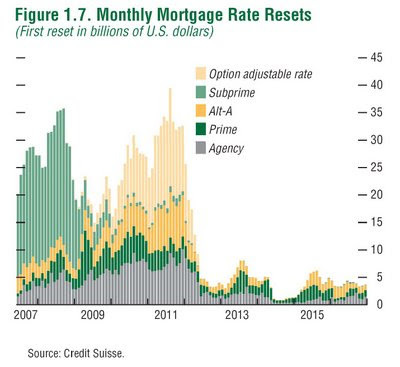 As I have said before, Mortgage Fraud is a huge problem in the current housing market. With home values on the rise, borrowers have a more difficult time obtaining financing. The fake employment problem arises when borrowers do not qualify for financing with their legitimate employment, income and assets. Here are some typical scams I have seen with my own eyes. Fake Self Employment: Borrowers say they are self employed in order to state that they make more money than they actually do. This works particularly well on stated income loans, where the borrower is not required to prove the income. the idea is that lenders will not believe that a janitor makes enough money to pay a high mortgage payment, but if that same person owns his own cleaning business.....well then he probably can! This scam is pulled off by placing an ad for a fake company in 411, and by getting a tax preparer or CPA to write a false letter stating that the borrower has indeed filed a schedule c for the past few years, and is a self employed individual. The 411 listing is cheap, $10-$50, and fake letters can be found for as little as $100. Not sophisticated but highly effective when dealing with lenders who don't check and don't care. I know of a few lenders, not in business anymore, that were allowing this "Self Employed" Scam fly through the system with fake reference letters instead of the CPA letter. Something that can be typed up on Word in a few minutes. While other lenders were allowing digital photos up self employed borrower's work vehicles, for example a van for a cleaning company. Surprisingly a lot of the vehicles looked oddly similar. Why you ask did they look so similar? Because the brokers, and borrowers were using the same photo and were taking adobe photo shop and changing the name for new applicants. The lenders knew and looked the other way. Why? Because they were making boatloads of money. 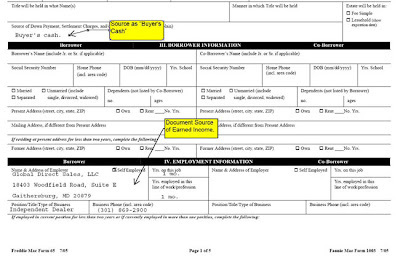 Below is a sample of a portion of the 1003, also known as a mortgage application. Guess What? Many brokers are out to get paid, and screw you over as hard as possible. Brokers have incentives that pay them money, to stick you in adjustable loans with prepayment penalties. Lenders were paying 3 to 4% rebates to brokers to sell Neg-Ams with 3 year prepay penalties. For the past few years mortgage brokers and lenders have been shoving neg-am loans down borrower's throats at an alarming rate. These complicated loans were meant for sophisticated borrowers, who have irregular cash flows. The purpose of the loan is to add flexibility in payment options, so borrowers, such as sales people, who have fluctuating incomes, can make reduced payments and not incur mortgage lates when they have a down income month. The problem is, greedy bastards out there saw how easy it is to sell a low payment option to uneducated borrowers, and started hawking them like they were the best thing in the world for people. Guess what? Neg-ams are not the best thing in the world for everyone. In fact they can be the worst thing in the world. I explain neg ams in another post, but the bottom line is you can end up owing up to 125% of what you actually borrowed. Here is the math, on a typical scenario. Let’s say you borrow $400,000 to buy a $450,000 condo in San Jose and you are putting $50,000 as a down payment. If you take a Neg-Am, instead of more conventional financing, and make the minimum payment, you could actually owe $5oo,000 on the condo you bought for $450,000. The way a neg am works is it allows you to pay less than interest only payments, in effect adding more money to your initial loan amount, or "principal". In reality you have the option of getting many different types of loans, but for simplicity let’s say these are the only options. A good broker would lay out all the options, and explain the differences or each. For example, the 30 year will have a higher interest rate than all the option, but the rate will never change and in 30 years you will have paid off your home, while the 5 year has a lower rate and payment now, but will become adjustable in 5 years and your payment could be higher. A bad broker would only tell you about the options he wants you to choose, because a) he only thinks you will take it if the payment is really low, or b) he wants to steer you in the direction of the option that will net him the most money. Cha Ching! That is the bottom line, a bad broker is only out to get paid now, and doesn’t give a crap about you! Hey, here's another little sneaky secret. Neg-ams make the most money for brokers. In the height of the real estate boom, brokers were getting paid up to 4% from banks to put borrowers in Neg-Ams. That’s right, the riskier the loan, the more the bank was willing to pay, because the actual interest rates are much higher than they would receive on a fixed loan. Make sure you don’t get ripped off by the "financial expert" you trust. Take a look at this article. A contractor in Florida built his dream home and now regrets the lavish choices he made on the details. Your broker may be making more money on your transaction than you know. Hidden payouts to brokers are prevalent in the industry, and only insiders know how to spot them. Obviously brokers and loan officers need to make money, they are providing a service and closing your loans is how they make their living. The question you need to ask yourself is: Do I know how much money my broker is making? The bottom line is, if you don’t know the whole story, you may be paying for it in your interest rate and monthly payments. With all the terminology and pages to sign, borrowers get caught in a whirlwind of paper and don't always know what they are getting themselves into. Make sure you understand the terms and ask your broker what the fees and costs are up front, that way everyone involved is on the same page. Brokers make money in 3 ways on loan transactions. The most well known is "points". The other two secret revenue generators are "junk fees" and rebates. Points refers to the number of points you are charged out of pocket to pay the broker for his services. They can also be referred to as percentage points or origination fees. Some brokers don’t charge points and only make money on Junk Fees and rebates, others don’t charge anything up front, and only make their revenue on rebates. In my opinion .75 of a point to 1.5 points is a typical benchmark for a normal loan transaction. This means you would be paying .75% to 1.5% of your loan amount directly to the broker out of your pocket. Junk Fees are an industry standard that refers to lender fees and broker fees charged to cover company overhead. These fees show up as line items like, "underwriting", "processing", "administration", and other similar titles. Typically the lender and broker will each charge their version of these junk fees. Rebates are the biggest hidden pay out for brokers. This revenue stream is also known as YSP, yield spread premium. It is money paid directly to the broker to charge you a higher interest rate on your loan. This tool was designed to help borrowers and brokers on transactions where borrowers had limited cash and were unable to pay for services out of their pockets. The idea is, a broker can still offer you a loan and make money without charging you directly. The fees are built into your loan as a higher rate and distributed across the life of your loan in higher monthly payments. When used with care this is a great way to help borrowers obtain financing without paying costs directly from their bank account. On refinance transactions these fees can also be rolled into your loan amount, so no out of pocket expense is incurred. I have personally seen brokers make upwards of 5% on a loan transaction by charging points up front and receiving rebates from lenders. On a typical California transaction, this is a huge amount of money. The most appalling part of this is many borrowers have no idea that their broker is walking away with huge sums of money. If the broker is also serving as a real estate agent on your purchase, they could be making up to 11% on your home purchase! Negative Amortization loans have become increasingly popular in California. I personally think they can be great loans, and I would recommend them to certain individuals as a great way to manage finances. The problem is, brokers have been using them as a way to close deals, make ridiculous amounts of money and trick borrowers into buying properties they can’t really afford. The Neg-Am or Pick-a-Pay as it is called is an adjustable rate loan, tied to an index. Popular indexes for this loan are the MTA, COSI, COFI, and the 6 month LIBOR. The loan allows borrowers multiple pay options, including interest only, and less than interest only payments. The most dangerous option is the less than interest payment. In this scenario the borrower makes a payment based on a 1%to 5% rate, even though their actual rate is much higher, in some cases as high as 10%. The borrower makes the less than interest payment, and the interest they don’t pay is added back to principal. If the borrower makes this min payment every month, they will continue to increase the amount they owe the bank. In declining markets this poses an obvious problem. More info on the Neg-Am. Mortgage Fraud is a huge problem in the current market. With home values on the rise in the past few years, borrowers were having a harder time obtaining financing. Traditionally borrowers had to prove that their net income was at least double that of their total projected income, including the new housing expenses. Traditionally borrowers also had to come up with down payments for purchases, as well as had to prove they had cash reserves to cover expenses if they lose their jobs etc. In order to get around the issue of increased home prices, and lack of cash for down or reserves, lenders, brokers, real estate agents and borrowers developed ways to trick the system. Lenders came up with new creative programs to qualify borrowers who did not qualify for traditional loans. These loans have been labeled "liar loans" recently. Basically borrowers were allowed to state their income on an application to qualify and never had to prove their monthly income. In many cases they were also allowed to state their assets and never had to prove they existed. In the later stages of the boom, lenders really pushed the envelope and allowed borrower to obtain 100% financing on Purchases and refinances, no money down loans, with no employment, income, or assets proven! The unbelievable truth is someone could purchase a home with no job, no income and no assets, as long as they had a decent credit score. You may or may not have heard of this term in the news. It refers to an adjustable rate loan that is set to a fixed rate for a short period of time and tied to an index. When the fixed period ends, your loan converts to an adjustable loan that moves based on the index fluctuations. Your rate and payments can increase by a significant amount if the index has moved up. The current market is characterized by low fixed rate loans tied to indexes that have gone up by 2-5% points depending on when they were recorded. Rates were at historic lows but over the few 7 years these indexes have steadily increased. For example, the Prime Rate, usually used for equity lines, has climbed from a low of 4.0 in 2004 to 7.75 now. (It reached 8.25 in mid 2006). If you purchased or refinanced in the past few years, you may have received an adjustable loan and may not even be aware of it. These loans are meant to be short term ways to lower payments, or for borrowers looking to sell some time in the near future. If you don’t plan on living in a home for many years this could be a great loan for you. The problem arises when borrower have short term loans, and plan on staying in the home longer than the fixed period. In the current market borrowers have been financing purchases with 2 and 3 year fixed loans with indexes that have skyrocketed and are causing huge payment burdens on the uneducated borrower. So the saga begins - You have all heard the news and read the articles about the mortgage collapse of 2007. I worked in the business with a subprime lender for 5 years during the boom and bust. I figure someone should put the real deal out there. I'm going to attempt to shed some light on what caused the boom, bust, and declining market we see today. If you ever thought about buying or refinancing a home you should check out the info. Step number one: Make sure you pick a reputable broker or real estate agent. There are great ones and complete fakes. This sounds easy, but there are a lot of wolves in sheep’s clothing. Tons of Brokers pose as friendly consultants, but the market is full of opportunistic money hungry thieves. They take you to the bank and laugh about it behind your back. I know because I have seen it happen hundreds of times.